Immortal Hulk #12 Review: The One Below All! – AiPT! Immortal Hulk #12 Review: The One Below All! It whispers through many mouths. It destroys with many hands. Its only weapon is hate. What can one even say? That’s the thought that comes to mind reading Immortal Hulk. Bursting with astonishing vision and visceral power, it grabbed the comic world by its heart last year and it has yet to let go. Every issue has been a lens into the terrifying world of the Hulk that is more reminiscent of EC Comics horror work than the traditional Marvel superhero comic. With each installment, the creative team builds further dread in the audience, throwing them into a raw and thoughtful reality that has much to say about human consciousness, morality, dichotomies and mythology. And it’s all executed with such fine precision, with such incredible formalism, that it simply takes your breath away. One can begin and never run out to things to say about Immortal Hulk, because it’s a classic-in-the-making, an iconic masterpiece full of thought and thundering visual ingenuity. And yet, what can you say about such a work, for which no amount of words are enough? What can you say about that which leaves you out of breath, simply speechless, as you read in awe of not just the work itself but the talent of its makers? But let us try, for there is no better book out right now than Immortal Hulk and it deserves to be discussed. What is the devil? Following the ominous quote that preludes the story, from the very first panel of the very first page, the issue asks us outright. It’s an interesting question but it’s also the one at the heart of the Immortal Hulk. It’s what the creative team of Al Ewing, Joe Bennett, Ruy Jose, Paul Mounts and Cory Petit have been consistently exploring through every issue of the story. The quotes, which have become a staple of the series thus far, have all been leading to the revelations of this issue. Quoting verse 44 from The Book of John, the issue emphasizes the explicit connections the series has been making, specifically in regards to God, The Devil and the nature of ‘The Father’ amongst all of it. If #11 discussed the nature of hell and the anger of god and how that concept, a Hulk, if you will, might manifest and be tied to the divine, #12 builds on that while acting almost as a mirror. Here we meditate on the specific existing ideas of what the devil even is and how one might define such a thing. The black and white pages, with eerie typewriter captions in white, are an inspired choice in this regard. They’ve been a recurring device through these last two issues, digging into theological and philosophical questions and they work perfectly. Seeping the color out, allowing the words to ring with the ambiguity they need to, the pages force the reader to pay more attention and take more time with them. They slow us down before speeding us back up in the sequences of the Hellscape. Bennett’s talent for visual storytelling, Jose’s inks, Petit’s lettering and Ewing’s masterful scripting come into sharp focus in these sequences, as they strike with astonishing potency. It’s no secret that Bruce Banner has long had a troublesome history with his father, who abused him as a child. It’s an element that the team has capitalized on massively, consistently using Brian Banner throughout the book as the overly devilish paternal figure, who haunts, taunts and terrifies. This issue sees those connections emphasized further to discuss the mythic, almost archetypical parallels in the story of The Hulk. We’re shown Bruce’s childhood, with scenes of the abusive father and the abused son framed in the context of the dichotomy between God and The Devil. The captions across the board work to great effect, thanks to Cory Petit’s meticulous work across the series and they’re especially vital in issues like this one, wherein so much relies on them landing. And in regards to fathers, the issue digs deeper into Brian Banner himself, the man who’s haunted Bruce all his life and has left a terrible mark on him. We’re shown Brian’s own history, before Bruce was born, when he himself was a remarkable Gamma researcher. In his own attempt to crack the code of the anomalies in regards to Gamma radiation and the third secret form of Gamma, beyond wave and particle, Brian accidentally discovered The One Below All. Cancelling all his research, he hoped to get away, but the very same day he was greeted with news of his wife’s pregnancy. Dichotomies are very much at the root of The Hulk and all that he is and Immortal Hulk is a book that has consistently understood that. The Hulk is a monster, a creature of the night and shadow. But the night and shadow cannot exist without the day and light, much like the Devil may not be without God or a Hell without a Heaven. Opposites that define themselves via contrast. Similarly, delving deeper, there’s a deeper dichotomy to the nature of the night and the shadow, the satantic archetype, one that isn’t as clearly delineated in its opposite. The book made note of this in the earlier issue, bringing up The Quabalah and The Tree Life within it, as well as The Qlippoth, its opposite. The highest point of the tree is Keter, the unity, while the lowest, Thaumiel, is division. What that truly means is displayed in the very icon we understand to be The Hulk, who is the shadow self, who is the devilish nightmare, the monster, the reflection underneath, which is divided and at odds with itself. Bruce Banner. The Hulk. And yet at the same time, there’s a whole other, more crucial layer at the heart of this, The One Below All and The Hulk. This division into two sides is explored via the analysis of two different types of Devils in the issue, the one who is capable of good and yet deliberately chooses evil and the other who is the accuser, the judge of souls and the wrath of god. This issue sees the final, full arrival of the long-teased and much heralded foe, The One Below All. It’s a grand entrance of a petrifying entity and it is awe-inspiring, aided by Petit’s great lettering. But as all tremble in his presence and shudder at his sight, The Immortal Hulk grins. It’s absolutely exhilarating. Bennett’s prowess at horror storytelling is some of the best in the industry at the moment and it excels here, as ever. Paul Mounts’ colors really set the tone for this chilling and dreadful saga, bringing a lovely texture and a sense of apocalyptic doom and darkness to the book without taking away from any of the bright and bombastic thrill of The Hulk and all that may come across him. 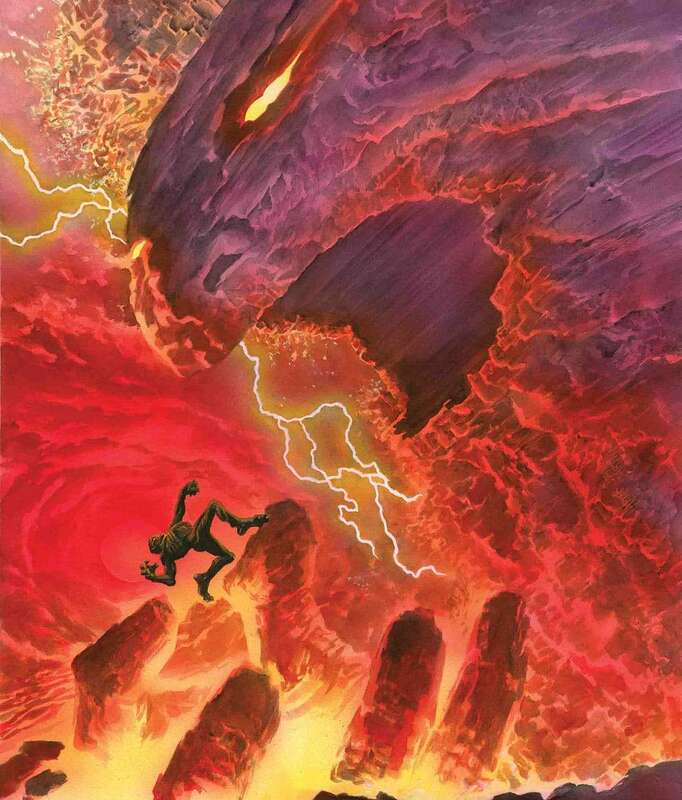 Immortal Hulk continues to be Al Ewing and Joe Bennett’s treatise on humanity, mythology and the dichotomies there in. It’s impossible to not feel the dripping dread that builds into screeching horror every issue, as the certainty that you’re reading a definitive and classic tale grips your heart. Ewing’s deft ability to weave together mythology, Marvel or otherwise, once more proves its effectiveness, as does Bennett’s talent for characterization and expression. While it’s as cosmic and as epic as any Marvel tale imaginable, it’s also one of the most intimate and heartrendingly personal. This is a series that externalizes that which is internal, firmly grasping the greatest strengths and possibilities of the mythologies it’s handling. You owe it to yourself to be reading this book. Ewing and Bennett are crafting a masterpiece for the ages. It is exhilarating to witness the awesome might of The Immortal Hulk.